Auroral backscatter radar observations were made from Ithaca, New York, at 50 MHz during the early morning of April 1, 1976, a period of high magnetic disturbance (Kp ∼ 8). The backscattered power showed large rapid (time scale of a few minutes or less) variations, characteristic of discrete radar aurora, from L = 3.5–4. Doppler spectra of waves propagating in nearly the north-south direction from up to 28 different ranges were obtained simultaneously with good spatial (7.5 km) and temporal (2 s) resolution. Some unusual spectra with very narrow peaks at Doppler shifts between about 70 and 90 Hz were observed and were apparently associated with sheared flows of the auroral plasma. These echoes were observed at the southern edge of the scattering region, which moved poleward with a velocity which sometimes exceeded 800 m/s. There is evidence that the echoes were generated above about 140 km. Present electrojet instability theories cannot explain these narrow spectra, but the Doppler shift suggests that they might be caused by ion cyclotron waves generated by field-aligned currents (electron drifts). However, the excitation of ion cyclotron waves requires currents considerably stronger than typically quoted mean values (∼10−5 µA/m²). Furthermore, the most easily excited ion cyclotron waves have wavelengths longer than 3 m and do not propagate in quite the right direction for detection by our radar. The threshold for the waves that we observe is considerably higher than the minimum. Intense localized currents, such as those known to be associated with auroral curls and vortices (J ≳ 10−4 µA/m²), appear to be sufficient to excite the longer (∼10–20 m) ion cyclotron waves in the upper E region; whether or not the field-aligned electron drifts are ever large enough to excite directly the 3-m waves we observe is an open question, but there is at least some evidence which suggests that such drifts do exist in very localized regions during highly disturbed conditions. 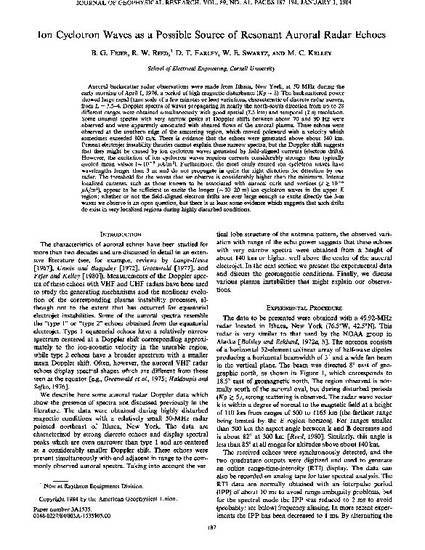 Fejer, B. G., R. W. Reed, D. T. Farley, W. E. Swartz, and M. C. Kelley, Ion cyclotron waves as a possible source of resonant auroral radar echoes, J. Geophys. Res., 89, 187, 1984.